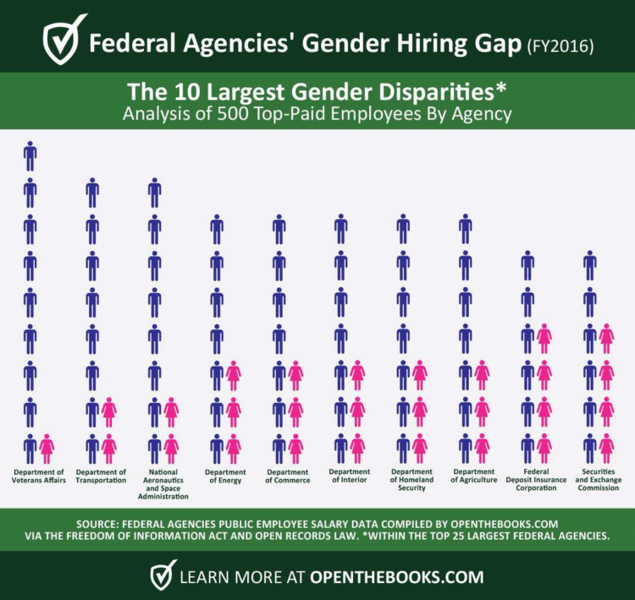 OpenTheBooks.com, a national transparency organization, recently released a study of highly compensated public employees that reveals a striking disparity between the number of men and women employed in top government positions. 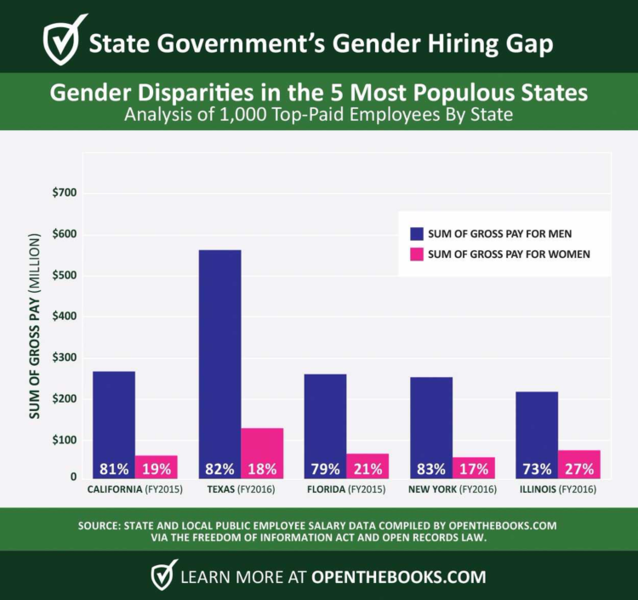 The OpenTheBooks.com Oversight Report — Federal & State Government’s Gender Hiring Gap analyzes the 500 most highly compensated employees from each of the largest 25 federal agencies; the 1,000 top-paid Congressional staffers; the White House payroll; and the 1,000 most highly compensated public employees within each of the five most populous states: California, Texas, Florida, New York, and Illinois. The report finds that top-paid men outnumbered women two to one at the federal level. Across the states, just two in 10 top-earners were women. Among the 12,500 highly compensated federal employees — the 500 top earners from each of the 25 largest federal agencies — 37 percent were female. The 7,869 men earned $1.5 billion and outnumbered the 4,631 women who earned $817 million. The Department of Veterans Affairs showed the largest gender hiring gap among agencies: 90 percent of the department's 500 top-paid employees were men. At the Department of Transportation, top-paid men outnumbered women at a four-to-one ratio. Among the 1,000 top-paid Congressional staffers, men — who were employed for a full year — outnumbered women two to one. Meanwhile, President Donald Trump’s White House payroll — data released June 30, 2017 — revealed 46 percent of his staff was female. Across the five most populous states — California, Texas, Florida, New York, and Illinois — men outnumber women in top-paying positions four to one. On average, just two of 10 top earners in the states were women. New York featured the largest gender hiring gap — 83 percent of the state's 1,000 top-paid employees were men. New York’s top earners received $307 million total, and $254 million funded men’s paychecks. In Texas — where top salaries ranged from $476,289 to $4.7 million — men received $565 million while women earned $120 million.